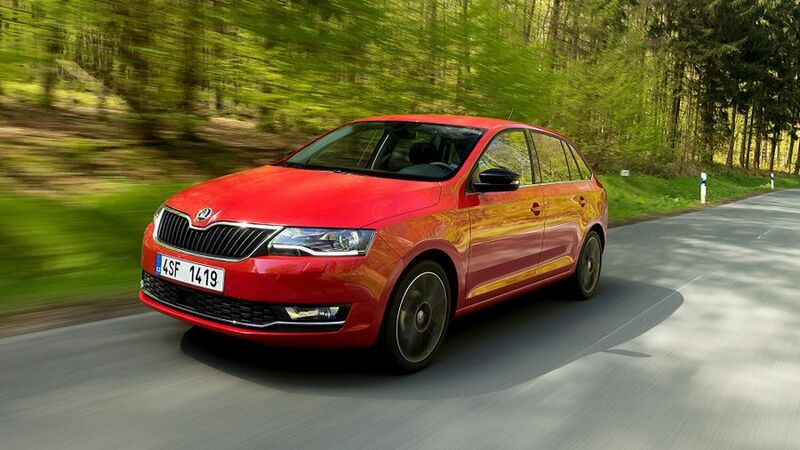 The Rapid Spaceback is a classic example of Skoda’s philosophy, ‘Simply Clever’. Offering loads of car for your money, it’s priced on par with most superminis, yet offers roughly similar levels of space to cars from the class above. It’s also a reasonably capable car in most areas. Pleasant enough to drive, thanks to nimble handling and nippy performance from its three-cylinder petrol engine, it’s a decent all round proposition, even if it is ultimately let down by an agitated ride and rudimentary interior quality. Sweet revving engine supplies the go, SE Tech spec delivers the kit. Noisy engine creates lots of vibrations, and S trim is stingy. It’s great on the juice, but not much else. 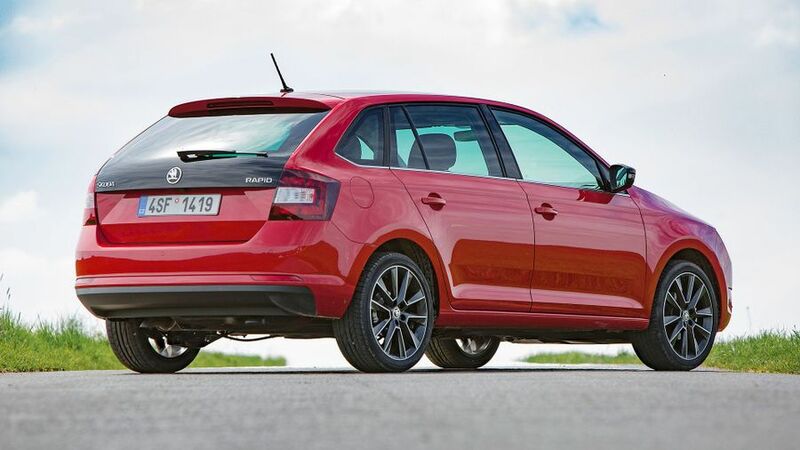 Interested in buying a Skoda Rapid Spaceback? You don’t have to squint too hard to recognise the family resemblance between the Spaceback and its more illustrious Audi A3 5-door cousin. With similar clean, crisp lines, it’s a smart enough vehicle, even if its rather boxy appearance means it looks rather conservative compared to a Ford Focus or a Vauxhall Astra. Entry-level S cars are very affordable, but don’t look particularly beguiling with steel wheels, and black door handles and door mirrors. You’ll need to fork out an additional chunk of cash for a second-rung SE trim for body-coloured mouldings and alloys. On top of this, you can spice things up a little further by specifying the optional panoramic sunroof with extended tailgate glass. 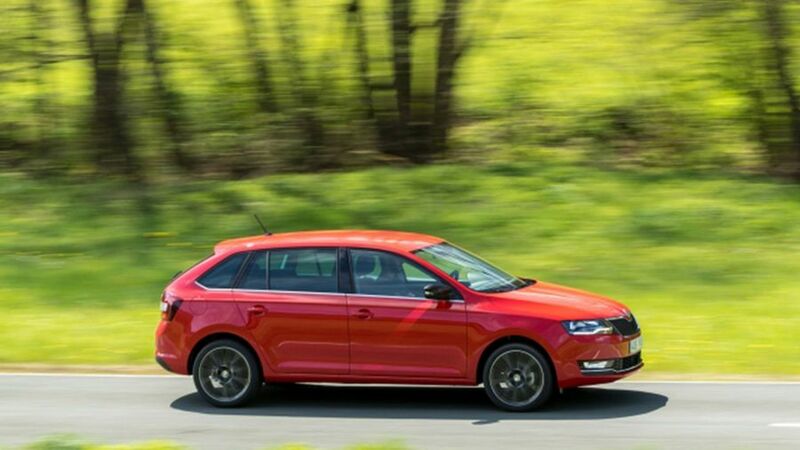 The Rapid Spaceback represents a bit of a half-way house between the Fabia supermini and the larger Octavia hatchback. Sitting behind the wheel, there’s a good range of steering wheel and seat adjustment. Overall, the cabin has a reasonably sophisticated, grown-up look, thanks to glossy dashboard and door inlays, and chrome door handles. The interior plastics look a little brittle and flimsy in places, but the assembly is accurate and solid. However, if you touch anything, you’ll discover all the plastics are extremely hard. This is particularly noticeable and rather uncomfortable if you accidentally rub your elbow against the door, or when travelling with your knee resting against the granite-like centre console. Given its styling, it would be easy to think of the Spaceback as a slightly larger estate version of the Rapid saloon. In fact, it’s the saloon which has the larger boot, with the Spaceback’s relatively modest 415 litres falling a fair bit short of the saloon’s 550 litres. However, the Spaceback's boxier body style gives you better access to the space available due to its rear opening, and compared with the price-matched hatchback rivals the Spaceback is up against, the capacity is pretty decent. The Spaceback’s boot is far from perfect, though. There’s an enormous load lip to negotiate when hauling heavy items in, and when you fold the rear seats down, the backrests simply flop down on top of the bases, leaving a stepped load bay. 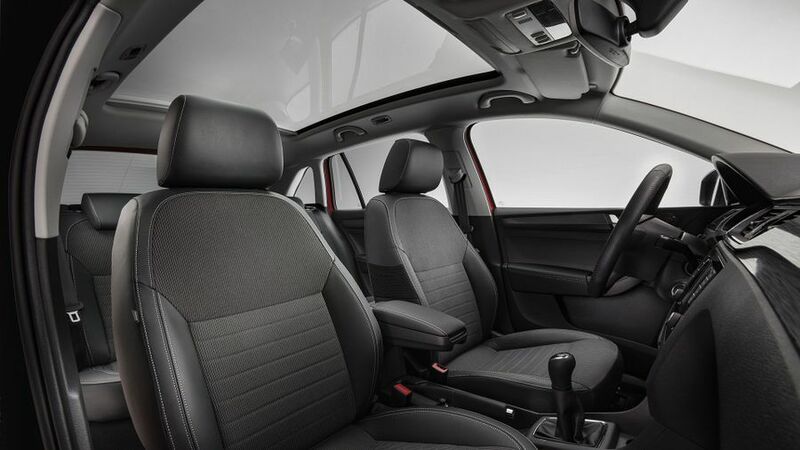 In the front, there’s plenty of leg- and head-room, but if you’re carrying a front seat passenger it can feel a wee bit tight on shoulder room. Where the Spaceback does deliver on its name, though, is in the passenger compartment. The rear seats have tons of head- and leg-room, so there’s space for even tall passengers to stretch out. There’s just about enough shoulder room to allow you to carry three kids across the rear bench, too. On the road, the Spaceback has a relaxed, easy-going character. It’s not the most engaging car to drive, but the controls are light and easy, while the ride feels reasonably civilised over smoother surfaces. The suspension does tremor rather too much when driving on nastier surfaces however, and things can get unsettled at higher motorway speeds. The handling is similarly mediocre: it feels secure and predictable, but it doesn’t respond with the same agility as the best hatchbacks, especially with the additional weight of a diesel engine up front. While road-noise is reasonably well suppressed, you will notice quite a bit of wind-noise, especially at motorway speeds as the breeze rushes past the door mirrors. The Rapid engine range kicks off with a pair of turbocharged 1.0-litre three cylinder engines. They’re identical in all but their power output, so you can choose the cheaper 94bhp version, or go for the punchier 108bhp version if you fancy a bit more pep. The more powerful of the two is, by some distance, the pick of the range. It’s unmistakably a three-cylinder engine from the moment you fire it up, thanks to its thrummy exhaust note, but it pulls eagerly at low revs and it’s capable of decent speed if you work it harder. Although the 1.6 diesel isn’t all that quick, and it is a little on the agricultural side, and transmits a few too many vibrations through the steering wheel and pedals, it is flexible enough to pull high gears at low speeds. The 1.4-litre three-cylinder diesel engine is a proper clunker. On top of the same characteristic three-cylinder thrum as the petrol engines, it also produces pronounced levels of combustion cackle, and drives high levels of boomy tactility through the body panels. The Rapid Spaceback is a very cheap car, providing you stick with the entry model, but you need to be aware that as soon as you step up a trim level, you’ll instantly add more than a grand to your invoice. Of course, you’ll hardly notice this increase if you are buying the car on a monthly PCP contract, and there are some particularly tempting deals on offer if you decide to go down this route. The engines are pretty easy on the juice, too. According to Skoda, the 1.0-litre petrol engine will return 64 mpg, while the 1.4 diesel will better 70mpg. Insurance costs are also pretty negligible. 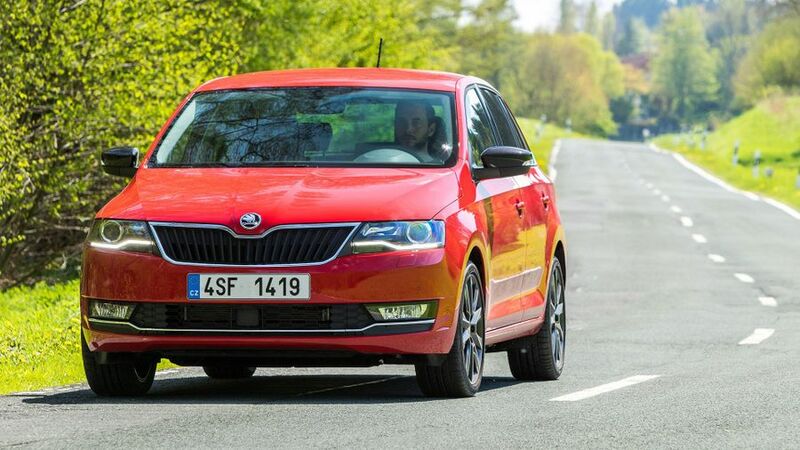 There isn’t much reliability data available on the Spaceback, but you can take some comfort from the fact that Skoda usually does very well in the various reliability and customer satisfaction surveys. The manufacturer is currently sitting reasonably pretty in Warranty Direct’s manufacturer standings, too. A three-year/60,000 mile warranty is no better than average for the class. The Spaceback provides all the safety kit you’d expect, including things like stability control and six airbags, while the latest models also get predictive pedestrian protection, including City Emergency Brake plus hill hold control. Although the Spaceback hasn’t been crash tested by the experts at Euro NCAP, and isn’t likely to be, they’re confident it should provide similar protection to that of the Rapid saloon, and that’s a five-star car. It scored a commendable 94% for adult protection, 80% for child protection, 69% for pedestrian impact, and 71% for its active safety kit. The Spaceback comes reasonably well equipped. Even the base-level S versions get: air conditioning; Bluetooth connectivity; remote locking; electric front windows; two USB ports in the rear; an ice scraper in the fuel filler flap; and a double-sided boot liner. SE Tech adds alloy wheels, sat nav, climate control, cruise control, powered rear windows, rear parking sensors, a leather multi-function steering wheel, and cruise control, plus an umbrella in a compartment under the passenger seat. Practicality and an affordable price tag are arguably the Spaceback’s biggest assets, but in many ways, it always feels like a car built to a tight budget. While many superminis provide a more engaging drive, the superb Vauxhall Astra can be had for not much more. 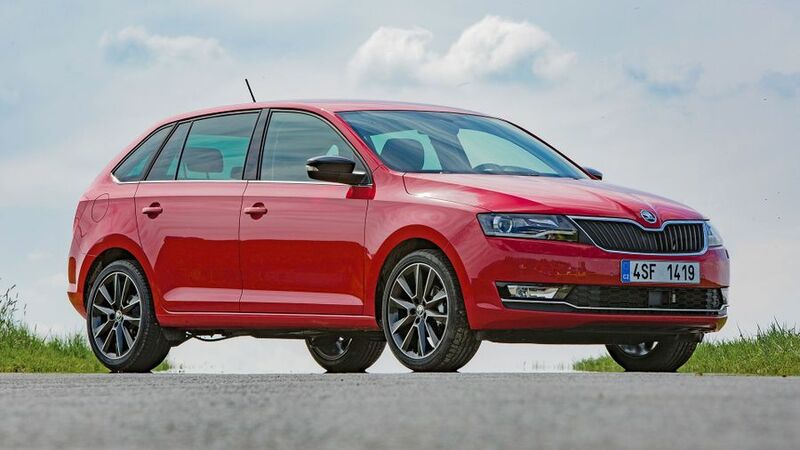 It’s also worth bearing in mind that if you can stretch your budget, the Spaceback’s stablemate, the Octavia, drives and feels like a far more sophisticated car. It offers even more practicality, a much nicer interior, a better driving experience, and far greater refinement.